Today Anonymous made another fun attack. This time time not for a certain cause, just for the lolz. You may not realize it, but HP has a feature called ePrint and they even have live demonstrations to test this. There is an HP test center whith a bunch of cameras and printers, then you go on their web-page and you can live print something to a real printer. 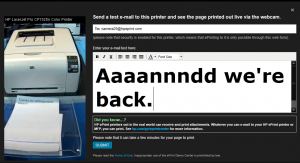 As you can guess the guys over at Anon took advantage of this and printed useless crap until HP had to completely shutdown their printers. you can have a look at the page and maybe even print something fun HERE. Enter the post to see a funny picture related to this posted by Anonymous!